Chisora lost his unbeaten record and British title in July, when he was outpointed by Tyson Fury. Since that defeat he has had a points win against Remigijus Ziausys last month, but this title chance as come from nowhere. A surprise, which could turn into a timely Christmas present for the Finchly man and British heavyweight boxing, a nice way to end the year. In an already busy weekend of action for British fighters, this unexpected title fight comes as an added bonus, to an already action packed few days. As well as the European belt, the WBA and WBO Inter-Continental heavyweight titles will also be on the line and a win for Chisora will definitely get his career back on track, ready for another heavyweight assault in 2012. "I’ll be fit and ready for this fight like never before, it’s the big fight I need to really get my juices flowing and performing like I know I can. I can’t wait for December 3 and winning that European title and bringing it back to Britain.” added Chisora. “Believe me, this is the biggest mistake they have made with his career and I’ll be going over to Finland to knock him clean out. He’s called the Nordic Nightmare, but he’ll be having nightmares about me for the rest of his life after I’ve left him flat out on the canvas. “I’m surprised Helenius’ people wanted me to fight their unbeaten golden boy, they must be going on my performance in my last fight and think I’m easy pickings,” said Chisora. Helenius, 27, is a good fighter, he is unbeaten and as some decent names on his record, such wins over the likes of Samuel Peter, Lamon Brewster and Siarhei Liakhovich stand out and being unbeaten it is hard to judge how good he is, Chisora will no doubt test that and as a great chance to claim a monumental victory away from home. 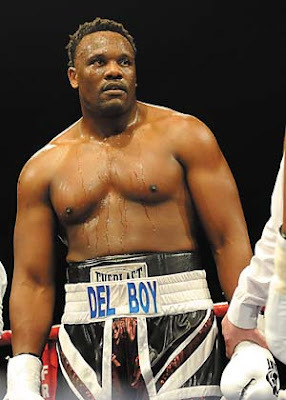 Chisora, 27, is the underdog going into the fight, but 'Del Boy' believes that Helenius (16-0, 11Ko's) as under estimated him and is judging him on the Fury loss. - But Chisora (15-1, 9Ko's) says they have made a big mistake and he is confident that he will go to Finland, knock Helenius out and bring the belt home.